August 10, 2008 by Alphageek in "alphageek bourbon blackberry 8830 rim"
Mrs. Alphageek broke the antenna on her cell phone the other day. How does this relate to my blackberry? Read on and find out. Mrs. Alphageek walked up to me several weeks ago and showed me her cell phone. The antenna on her phone broke in half. She liked her cell phone and wanted me to get another antenna. I tried to tell her that most folks just renew their contract and get a new phone, but she did not believe me. It is okay, most folks do not listen to their resident geek. So we headed out to find a new antenna. Radio Shack once provided replacement antennas for cell phones but not any more. Radio Shack sales folks said "get a new phone, yours is old anyway." We went to the Verizon store in town. The Verizon store had a used car lot feel to it, so we left. We drove down the road to BJs. I could make a lot of jokes here, but Alphageek's Mom reads this blog, so I will just move on. We looked at the cell phone counter in BJs and Mrs. Alphageek found a phone she liked. It is called the Juke. It is a pretty nice phone, but I don't think it can fake anyone out. I was looking at phones too, but it is hard to buy a phone when you can't take a camera into work. You have to leave the phone in the car, or worse, you leave it in your pocket and take it to work anyway. I was looking at a blackberry and Mrs. Alphageek said "buy it". I did not argue very much and made our purchase. Her phone was free because mine cost so much. I saw the color and thought the blackberry was pretty cool. My previous phone is so old that I can't do much with it. The blackberry allows me to surf the internet and use email on the device. I have at least customized the background, as you can see in the picture. I have to say thanks to Mrs. Alphageek for approving this purchase. It might be the most expensive cell phone antenna ever. Because I have never had a cool phone before, why don't you leave a comment and suggest some cool things I can do with my new phone? Even the Alphageek would like to hear your suggestions. I can just delete them from the blog if I don't like them. 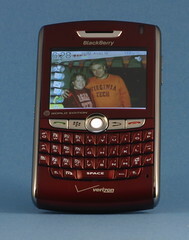 "alphageek bourbon blackberry 8830 rim"